Surf, spice, and everything nice: Sri Lanka! We always intended to include Sri Lanka, land of serendipity, on our round the world adventures, but our swifter than planned departure from India threw us into an un-researched land. In the day we had to plan our travels, rather than reading about the different parts of the island, or checking on the status of the recently solved 26-year civil war (which came to an end in May, 2009), we prioritized studying various websites trying to map out population density, both of humans and divine bovines. Far more important to setting the tone of our trip was re-setting our state of mind, rather than fixing the locale or accommodations. Would Sri Lanka be the tropical island cross between Southeast Asia and India we were looking for or would it be a mini-India? We scoured through the un-curated snapshots uploaded to tripadvisor, pinterest, and AFAR from anonymous travelers to get the skinny and mentally prepare. Pleased to find images of aquamarine waters with white-sand beaches, classic 1950s Ambassador cars parked on the clean-swept cobblestone streets of Galle, the fort city in the Southern tip, amidst whitewashed columns and colonial architecture, we booked our flight into Colombo with the intent to head South, looking for the calming open vistas that the sea never fails to provide. It was a miserable journey, the flight departing from Mumbai at 3:10AM. The kids were not thrilled to be standing on line at customs at this hour, but they woke up in good time once the steamy air-conditioning of the main cabin took full effect on the humid air. We landed, heads a little foggy from the short mid-night flight, to a tropical dawn. Right away we started to notice the characteristics of a very different national identity and culture emerge. Our customs process was quick—we had pre-filled in an online form for an electronic visa—and much to our surprise it worked! 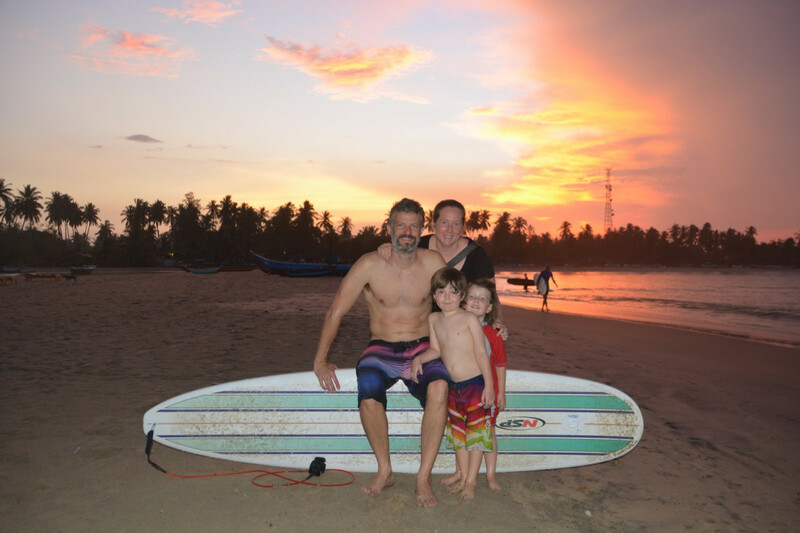 We gathered our surfboards, luggage, and limp children and were met by a tan van covered in surf stickers ready to take us on the long drive past Colombo to the Southern beaches where we had booked a few nights of R&R to plot our further exploration. We drove through Colombo in the early morning hours, winding through the country’s only real city, watching the morning rituals unfold from our dream-like state. With only 20 million inhabitants in Sri Lanka, the effects of population density on the environment are immediately clear: every storefront was swept, all the gutters were clear of trash and debris. Everyone seemed happier in general. We wondered if this general feeling had anything to do with the predominantly buddhist philosophy. Although there were far fewer Saris on the women, who dress much more western with flowing knee-length skirts and form fitting tee shirts, the men tend to stick more to a traditional dress of a long sarong folded as an ankle length skirt in many colors of cotton, but with bright plaids prevailing as the trend (Bill Cunningham of NYTimes: watch out). We arrived at our 6-room, minimalist, beach-side masterpiece of a hotel at 9:30AM, greeted with fresh tropical fruit smoothies with curly q-ed straws. The pool was large enough to swim laps and the views were unobstructed down to the ocean’s surf a few meters away. The tension we had pent up as a family was immediately relieved in those first few deep breaths of salted air. 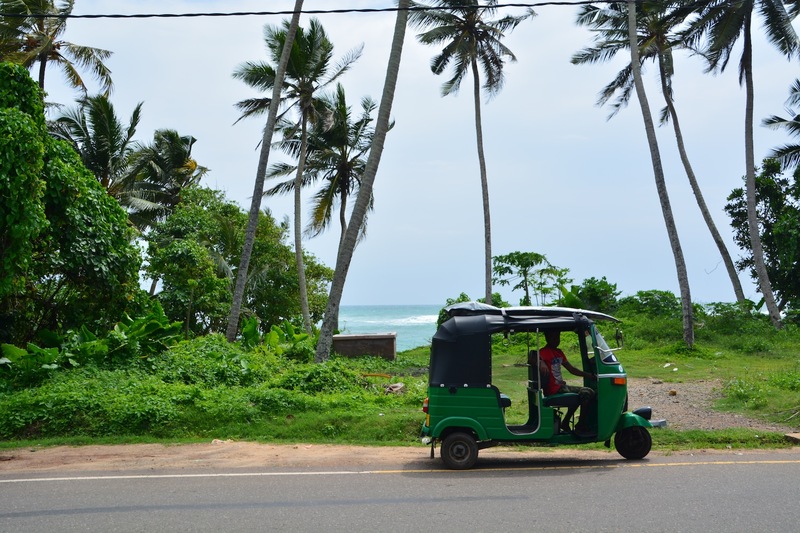 After spending a couple of days relaxing at the hotel, and taking small tuk-tuk rides around town to arrange surfboard ding repair and rentals, we set out on my birthday to explore Galle, a fortified old port town that purportedly even pleased Paul Theroux with its old-worldly charm. We walked the cobblestone streets under an unforgiving sun, but caught a nice sea breeze once we reached the top of the ramparts and watched the local boys jump from the fort walls into the shallow waters below. 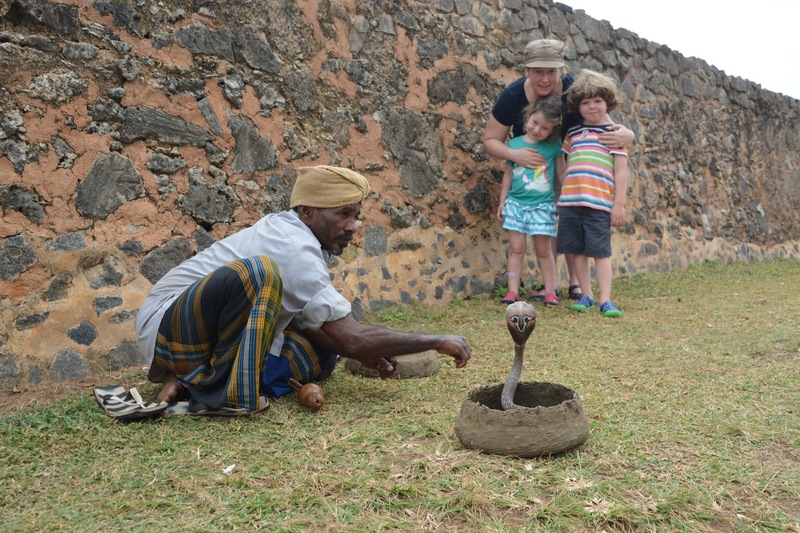 To top off a lovely day of unhurried if humid exploration, we chanced upon a snake charmer at the base of the fort. In all our world travels, I have always imagined but had never before come across a cobra charmer, woven basket, flute, turban, and all. 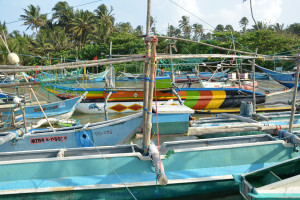 Needless to say, we were beguiled by the snake and its master, and left Galle with spirits uplifted by the magic of travel. With a few days more research under our belts, we realized that we had arrived at the tail end of the East coast surf season, and a month before the west coast surf season was slated to begin. Drats! 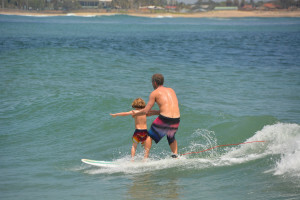 We beelined it for the East coast, to the world renowned Arugam Bay, seeing that a lingering swell was scheduled to hit, perhaps the last of the season. The 8 hour drive around the southern tip of the island was full of sights: fishing villages with hundreds of outrigger straddle-on-top canoes, stilt fishermen, secluded coves on the beach, Buddha shrines every 100 meters or so (some adorned with flashing neon lights, others more subdued), dagobas (stupas) up to 20m high, and fruit stands galore. We passed through a cashew nut village, a pottery village, a bike-factory village and more: each area seemed to have a specialization. 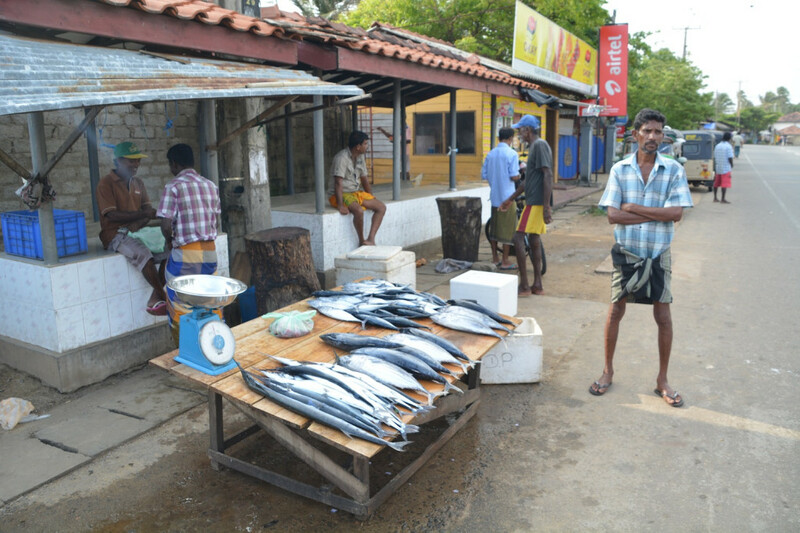 We essentially re-traced the entire coast line affected by the 2004 Dec. 24th Tsunami: the relief and rebuilding efforts are still underway in the less touristed areas, and some agencies seem to have permanent establishments. There are many memorials and photography exhibits scattered amongst the towns; the nation is still healing 9 years later from the 30,000 casualties and the displacement of 1.5M people (7% of the total population), but understandably it wasn’t mentioned much in conversation. We got a better sense of Sri Lanka today by visiting the contemporary art galleries and talking with tuk-tuk drivers and the owners and employees of our hotels. For a country that endured a civil war and the Tsunami, the people are amazingly resilient, with a strong focus on building education and opportunities for the next generation.